As runners or any athlete, really, we know the importance of properly feeding our muscles. Adding protein immediately after a workout or long any run can help with recovery as well as muscle soreness. Plus, it just feels good to reward yourself for a job well done. There are a lot of great protein products out there, but I'm always excited to try something new, so I was super pumped to have the opportunity to try out Designer Whey. Great incentive to go work out, am I right? I received such a fun variety of different products - bars, shakes, drink mixes, and of course, whey powder. I couldn't wait to dig in. I don't think there was anything in this package that I didn't like, and I can be kind of picky when it comes to protein. After a workout, I can't really seem to eat a protein bar. I don't know. I think they seem too heavy or something for me, so I tended to grab a bar more for a snack to help get me through the afternoon. They come in 3 different flavors - Triple Chocolate Crunch, Chocolate Caramel Crunch, and Peanut Butter crunch. 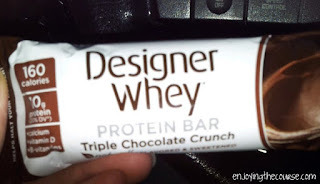 I'm a candy bar girl, and I sometimes have trouble with the taste/texture of protein bars, but these were really great! My favorite was the Triple Chocolate no surprise there! The protein taste wasn't too overbearing in these, but it was definitely still there. YUM! Not much else to say about them. 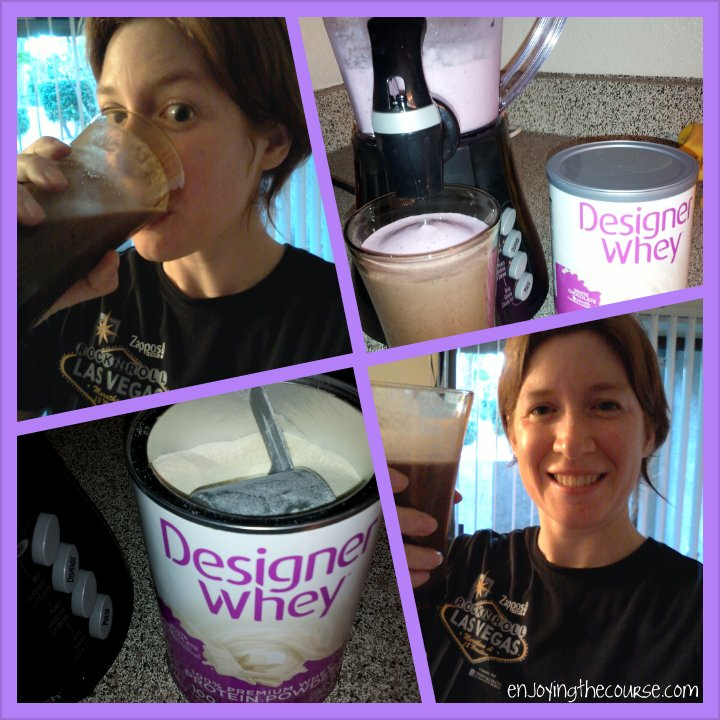 I slurped down both the Gourmet Chocolate and French Vanilla super easily after a hard run. They were a perfect light treat after a run. I also liked that they didn't need to be refrigerated until after opening. Of course, who wouldn't drink the entire shake at once? They might have been even better cold, but I only tried them at room temperature. 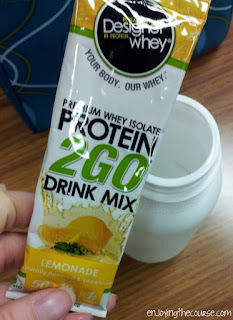 These were very easy open, which was great, because sometimes after a hard run the last thing I need is to be thwarted by a hard-to-open protein shake. It's no secret that I have a difficult time drinking water. I don't generally like the taste it also makes me have to pee. a lot., but mostly, I just forget to drink it. It's not like I'm really substituting it with a lot of other drinks; I just don't consume a lot of liquids throughout the day. These drinks mixes made it easier for me to down some water. I liked knowing I wasn't just adding flavor to my water, but some extra protein as well. Bonus! These come is 3 great flavors - Lemonade, Mixed Berry, and Tropical Orange - and are packaged in individual packets to easily add to your water bottle. Note: I found that this mixed best when I filled the water bottle with water first before adding the drink mix. If you put the drink mix in first, be sure that your water bottle is nice and dry. Otherwise it might not mix as well, and you might find some clumpy powder stuck to the bottom of your bottle when you're finished. Their powders come in a wide variety of flavors from chocolate to vanilla to praline. Plus more. I received a canister of both the French Vanilla and White Chocolate. I've never actually tried protein powder just mixed with water, so I made a point of trying it this way. I tried it with the White Chocolate, and while the taste wasn't bad it was actually a quite good, the smell kind of turned me off a bit. It unfortunately, also left kind of an aftertaste in my mouth that I didn't really enjoy. That said, I loved both of these powders in the smoothies I made! I tried the recipes on the back of the canisters plus I experimented a bit on my own. Smoothies are fun and easy because you just dump in some milk and/or juice and some frozen fruit, a scoop of powder, blend and voila! You have an excellent, delicious smoothie. I found that making my smoothies in the morning with the addition of this protein powder helped to conteract the tartness of my fruit - making it unnecessary to add any sugar or other sweeteners. Yay! 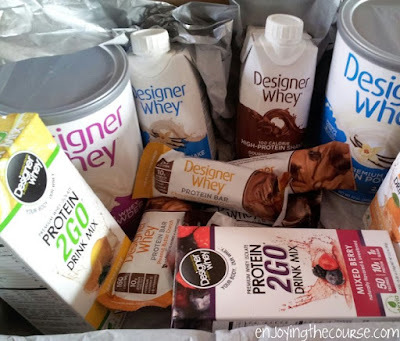 Overall, I really enjoyed both the flavor of all of these products plus the variety of the types of products. 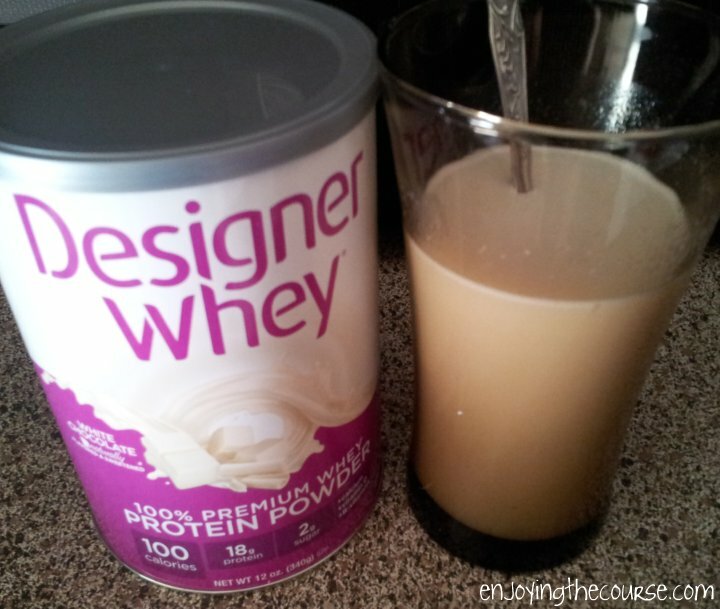 Adding protein to your diet is essential, and Designer Whey makes it so easy! Neat! 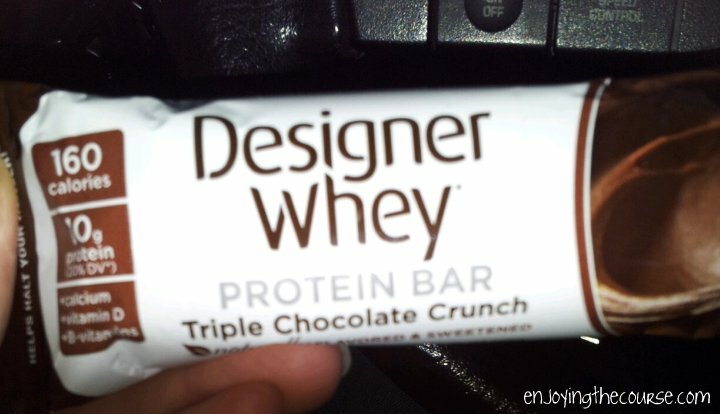 I've never tried Designed Whey, but it looks great! Thanks for the awesome review! Not big on WHEY protein, but I am glad you enjoy them. It is however nice to see that these products (aside from the bars) don't have much sugar! They seem to have quite a variety of flavors. Not sure I could ever really get on board with just mixing with water, though. I haven't tried any of the shakes yet but i love the powders and i feature a few of them on my site, White Chocolates my favorite! Thanks for stopping by, Nick! I usually stick to chocolate or vanilla, but I should branch out into other flavors as well.